Hidden in the hustle and bustle of the Hoover commercial district, Aldridge Gardens offers Over the Mountain residents a serene and convenient escape. The grounds include gardens of hydrangeas, whimsical sculptures and a waterscape. Despite the garden’s many natural and educational offerings, CEO Tynette Lynch said there are only 10 paid employees. “We have 10 employees and that is including the people who are paid to work on the grounds. But we have 200 volunteers who make things happen,” she said. 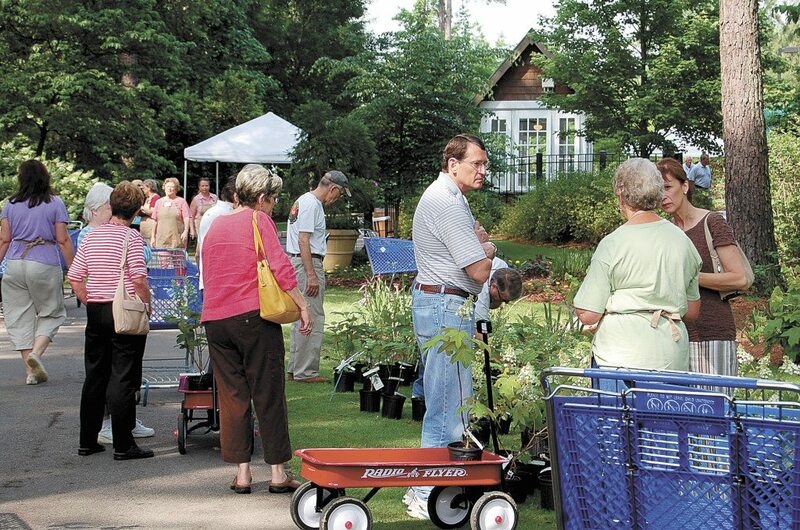 In fact, the annual Aldridge Gardens plant sale is completely run by volunteers. “They handle it start to finish. They order the plants, tag them and help cart them to people’s cars,” Lynch said. Because workers donate their time, the gardens is able to keep all the proceeds to maintain the grounds and expand the programming at Aldridge. This year’s plant sale is May 6-7 with a members-only preview sale May 5. “People look forward to this every year. Things go quickly and by Saturday afternoon we are almost always sold out,” Lynch said. Organizers try to offer plants that aren’t typically found at a garden store. Lynch said people come to the Aldridge plant sale because of the wide selection of hydrangeas, hostas, rhododendrons and roses. While the plant sale is the largest volunteer-led event of the year, most of the programming at the gardens is also run by volunteers. Aldridge Gardens is a popular field trip destination and it is volunteers who guide students through the gardens and supplement classroom curriculum. Lynch said many are retired teachers. Registration is open for summer camps at the gardens – another way volunteers are instrumental in Aldridge’s operations. During June, children may spend the morning at the gardens learning about nature and its importance. A popular camp is the “American Girls in Aldridge Gardens,” in which children bring their dolls to explore the gardens with them. Lynch said the gardens wouldn’t be what they are without the dedication of educated and experienced volunteers. Other fundraisers for Aldridge include “Hydrangeas Under the Stars” and Art in the Gardens. Lynch said visitors have been enjoying the new azalea trail and the new bonsai display – donated and maintained by a local bonsai enthusiast. For more information about the plant sale, classes or volunteering visit aldridgegardens.com.